Director: Cameron Crowe. Cast: Patrick Fugit, Kate Hudson, Billy Crudup, Frances McDormand, Jason Lee, Philip Seymour Hoffman, Fairuza Balk, Anna Paquin, Bijou Phillips, Zooey Deschanel. Screenplay: Cameron Crowe. Most of what I've been reading lately in regards to Almost Famous has been written in great perplexity, as in, how could a film this good make so little money? I am equally baffled by the film, but for the opposite reason. It comes as no surprise to me that a movie with such a limited target demographicpeople old enough to remember the music of the early 1970s, but not so old that they didn't hate it the first time aroundwould be a dud at the box office. However, why DreamWorks was willing to foist upwards of $60 million on this vanity project escapes me totally, as does the rapturous enthusiasm with which the film has generally been received. Is there a second, alternative version of Almost Famous circulating out there that's a bit more organized, more credible, and less uneven than the one I saw? I showed up to this movie fully persuaded of the Cameron Crowe As Miracle Worker hypothesis that apparently reassured the accountants at DreamWorks. I've now seen Jerry Maguire three times, and though I can pinpoint plenty of winning performances and agreeable moments, the film as a whole mysteriously proves even more transporting every time I view it than the sum of its estimable parts would suggest. Crowe has got the stuff of a good screenwriter, and he drew more relaxed, natural performances from Tom Cruise, Renée Zellweger, and Cuba Gooding Jr. than we have seen from any of them before or since. Still, some hard truth: I felt incredibly distant from Almost Famous, not only unconvinced by several major characters and events, but increasingly suspicious that this film isn't about anything except a young boy's awakening to the rock & roll life, an existence of which he remains an observer rather than an actual participant.These events must have mattered an enormous amount to that young boy (especially since he went on to make a film about them), but they mattered disappointingly little to me. The film begins with the frantic escape of 18-year-old Anita Miller (Zooey Deschanel) from the household of her egghead mom Elaine (Frances McDormand), a college professor so distrustful of youth culture that she accuses Simon and Garfunkel of being toked-up drug fiends. When Anita elopes, then, it isn't for the love of a man but for the love of an era, specifically a musical era; instead of justifying her flight in words, she "explains" by playing the song "America" by those notorious dope fiends. Elaine, a strict parent but not a restrictive one, reconciles herself to the fact that her daughter is moving on and moving out. Meanwhile, Anita has bequeathed her entire vinyl collection to her young brother William (Patrick Fugit), who will eventually develop such a love of the music that he makes it his life's mission to write about the tunes and the guitar-gods who make it. These early sequences establish a few of the abiding pleasures Almost Famous has to offer: the delicate, colorful compositions of John Toll, who finally gets to train his marvelous camera on less epic subjects than the battles of Braveheart and The Thin Red Line; the spiky, unobtrusively mannered performance of McDormand; and the atmosphere of uncynical fondness for an entire milieu. In terms of recreating an entire time and place, Almost Famous is certainly Crowe's most ambitious and successful effort. Also dropping in on the early stages of Crowe's party is Philip Seymour Hoffman, who is building a strong case for himself as his generation's most welcome character actor. Lester Bangs, the real-life rock critic he impersonates here, was not as vivid a creation for me as were Hoffman's dual successes in last year's Magnolia and The Talented Mr. Ripley, but mostly because the character ultimately serves a too-overt structural purposethe daffy but worldly-wise sounding board for young William's naïve ambitions. Still, there ain't a movie in the world I wouldn't invite Hoffman to participate in, and Crowe has written this smart performer some smart, clever things to say, particularly about how William must learn to write about rock stars without imagining that they like him, or trust him, or sincerely desire his friendship. And yet, even if Almost Famous gets off to a promising enough start, in at least two ways the introductory segments warned me of tendencies the rest of the film dispiritingly continues to enact. First, though Anita's use of music to "speak" to Elaine bears some genuine affect, Crowe's movies have always made uniquely wise and emotional use of music; Peter Gabriel's "In Your Eyes," Bruce Springsteen's "Secret Garden," and Tom Petty's "Free Fallin'" not only appeared prominently in Crowe's earlier pictures, but the songs themselves were fundamentally reshaped for future listeners by the glorious romantic contexts to which the director integrated them. In other words, without really trying, Cameron Crowe has already made his most touching points about popular music. To devote Almost Famous entirely to that subject is like blowing up a beguiling subplot from his earlier work into a separate, two-hour narrativepossibly more pressure than Crowe's unadulterated fondness for the music can sustain, or should have to. More problematically, the expository sequences in Almost Famous did not seem to me to portray its own characters consistently or coherently. In virtually the next scene after she lambasts Simon and Garfunkel, McDormand's Elaine is dropping William off at an arena concert where he hopes to meet the band, a conspicuously more ragtag outfit than the "Bridge Over Troubled Water" fellas. Whither the change of heart, I asked, but nothing in the film explained it. Sure, Elaine obviously loves her son, but are we then to assume she had less indulgence or patience for her daughter's cultural appetites? Elaine's semi-prudishness is quickly set up as a defining trait of her character, then as quickly set aside so that the rest of the plot, with William as rock reporter, can get moving. The movie can easily survive such a switcheroo, but I had less of a sense of Elaine, and therefore of her children, than I wanted to, and certainly Jerry Maguire featured no transitions or turn-arounds quite this abrupt. Indeed, pacing and credibility remained problems for me throughout Almost Famous. I won't describe how, but William eventually becomes part of the "household" on the touring bus of Stillwater, the fictional, Boston-ish band that becomes the center of the movie's narrative. Led by a singer (Chasing Amy's Jason Lee) who feels the dark, charismatic guitarist (Billy Crudup) steals too much of the band's media attention, Stillwater is clearly a fractured family. The brief glimpses we are allowed of the band in performance, driving out infectious songs with titles like "Fever Dog," do suggest they are energetic if divided performers. I wish, though, that these concert scenes had been longer or more frequent, so that we could approximate some of the closeness to the band and their music that is such a singularly defining trait of William himself, and of the other important protagonist. This latter figure is Penny Lane (Kate Hudson), the self-appointed doyenne of a group of adolescent girls called the BandAidsFairuza Balk and Anna Paquin are also memberswho insist they are not groupies. Rather, they insist that they attend Stillwater's concerts and share the musicians' hotel rooms as their contribution toward maintaining the fresh vitality of the music. (I think the ladies doth protest too much.) William is smitten by Penny Lane, as are the film's cinematographer, makeup/hair stylists, and costume designer. Still, her own heart is set on Crudup's mercurial Russell, who may or may not return her affections. Obviously, Crowe could take the narrative in a number of different directions from these basic premises. We ask in vain, though, what this film is about: the escalating tension between the bandmates? the rivalry of Russell and William for Penny's love? the delusion of the BandAids, or the cynicism of the Stillwater blokes for exploiting such hero-worshipping fans? the perils of seeking stardom in an industry that only cares about your last single, your latest magazine cover? 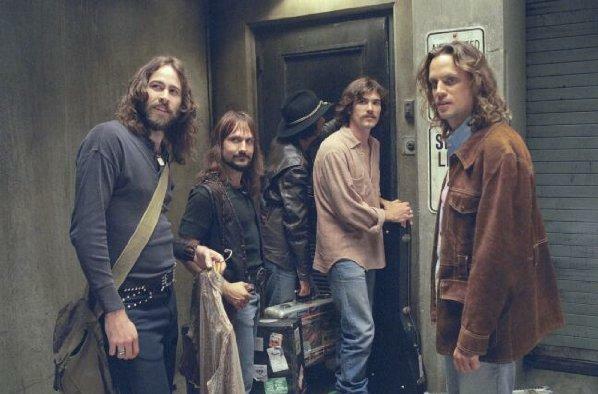 Some reviewers have charitably granted that Almost Famous is about all these things as well as, above all, William's coming of age as a writer, a fan, and a romantic. I would be more convinced of this if the scenes of Almost Famous actually possessed more momentum, or if set-pieces like Russell's catastrophic visit to a teenage fan's house party or a wildly misconceived "confessional" sequence aboard a turbulent plane flight didn't feel so forced. As though he realizes that McDormand's character is as close as he's come to genuine, believable humanity, Crowe's best scenes are staged as phone conversations between Elaine and a series of cast membersFugit, Crudup, Balkall of whom seem less real, less dimensional when they're talking with anyone else. The most troubling character in that regard is Penny Lane herself, who, after William, is clearly the character in whom Crowe has invested the most emotion. Unfortunately, he writes the character, and Hudson plays her, just the way wide-eyed, 15-year-old William would have perceived her. Penny is a luminous dream-vision; she looks ravishing, but she acts silly, and Crowe spends too much time protecting her from obvious questionswhy is she so fixated on Russell, for one, when he obviously doesn't care?to give her any substance at all. The character is as evanescent as a rainbow, all sweetness, color, and light, but no matter what anyone says, she doesn't actually lead anywhere.